Note the discolored and drying fruit that will soon fall to the ground. Photo by Jay Pscheidt, 1993. Here mummified blueberries and brown apothecia are ready to discharge ascospores. Photo by Jay W. Pscheidt, 1995. Primary symptoms of mummy berry on a floral cluster. Primary symptoms of mummy berry on a developing shoot. 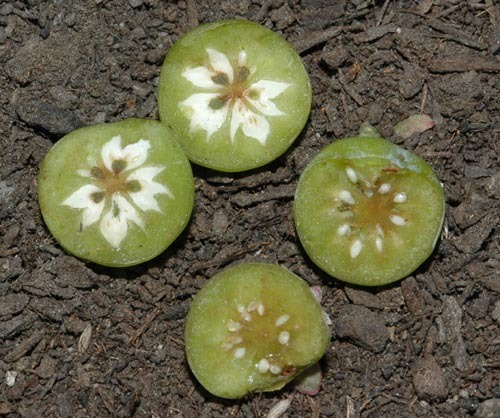 Infected green berries show no symptoms unless they are cut open. The fungus begins to fill the carpels of the infected berry on the left while seeds form in the healthy berry on the right. Cause The fungus Monilinia vaccinii-corymbosi overwinters in mummified fruit (pseudosclerotia) on the ground. Mummies can survive for at least 2 years and maybe more. Often mummified fruit becomes caught between the stems of a single plant near the ground. Mummies have a chilling requirement of many hours below 45°F. In early spring, when the temperature rises above 45°F, about the time floral and vegetative buds begin to break, fungal fruiting cups (apothecia) grow from overwintering mummies in or near the soil surface. Apothecia mature over an average period of 17 days but can range from 10 to 28 days. Many apothecia can emerge from just one mummy. Soil temperature, soil moisture, and solar radiation were identified as the most important factors influencing ascospore release in the PNW. Ascospores (primary inoculum) from apothecia are wind dispersed 100 feet or more and infect flowers and leaves shortly after buds open. A second type of spore (conidia or secondary inoculum) is produced in about 3 weeks on blighted flowers and shoots. These spores are spread by wind, rain, and various insect pollinators to healthy flowers. Flowers are most susceptible just as they open and infections lead to the mummy berry symptom. Flowers that are already pollinated are less susceptible to infection. The potential for loss is greater for primary infection because a single infection can blight all the flowers of one cluster. The losses from secondary infection can also be significant but the potential is less because only one berry is lost from each infection. Infected, sporulating shoots become ultraviolet reflective, fragrant and secrete sugars all of which attract insect pollinators. 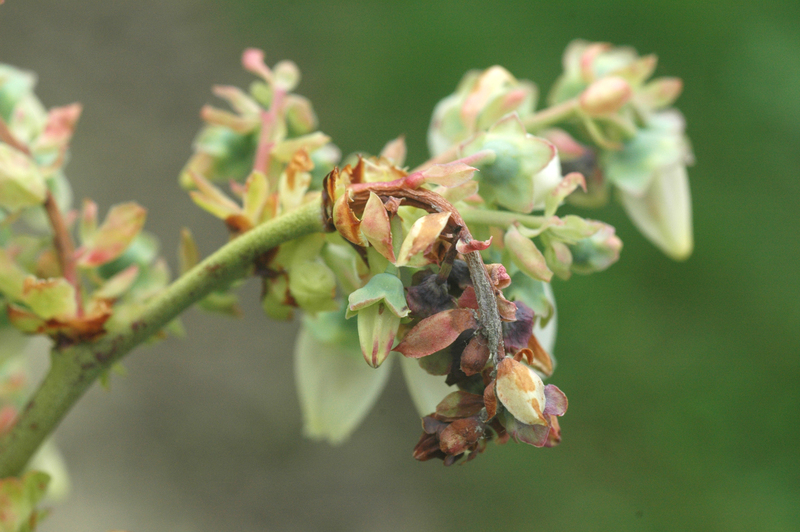 Insects then move conidia from these infected shoots to healthy flowers increasing the number of infected berries. 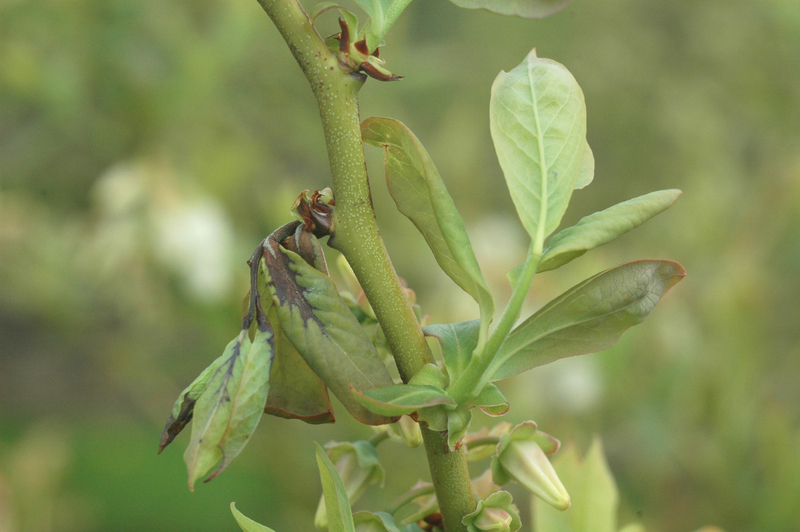 All species of Vaccinium are infected by species of Monilinia causing a mummy berry-like disease in each. Each species, however, is highly specialized to its host and therefore cannot induce disease in other hosts. For example, the fungal species attacking red huckleberry cannot attack highbush blueberry and vice versa. 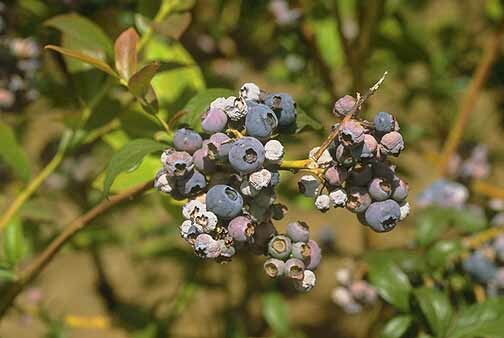 The blueberry cultivars Bluejay, Bluetta, and Olympia are considered resistant to both phases of the disease while the cultivars Blueray, Berkeley, Earliblue, and Northland are considered very susceptible. Symptoms Infected flowers turn brown and wither, as if they had been frosted. Stems and shoots turn dark-brown with the necrosis extending into leaf petioles and slightly into the base of leaf blades. Shoots quickly collapse and die soon after. About 3 weeks after primary infection, a brownish gray mass of spores develops on blighted flower stalks and leaves. During early berry development, diseased fruits look like healthy ones; if cut open; however, the spongy white fungal growth can be seen within the carpels. As berries approach maturity, infected berries become a reddish buff or tan color in contrast to the waxy green of healthy fruits. Many of the diseased berries fall before healthy berries are harvested. Mature mummified berries are gray, shriveled, and hard. Apothecia can be found under bushes where leaf debris or mulch has been left undisturbed. 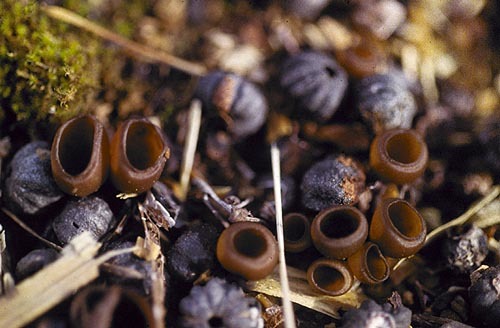 In spring, before bloom urn-shaped apothecia emerge from the mummies and are light brown to brown. The tip of the stem is darker and eventually expands into a cup-shaped structure 0.1 to 0.4 inch wide. Cultural control Control tactics applied to the soil may need to be repeated often since apothecia develop and mature over a period of several weeks. In fall, before leaf drop, shallowly cultivate to bury mummies. Research in Georgia indicates that burying mummies 1 inch or more below the soil prevented apothecia from reaching the surface. A two-inch layer of Douglas-fir sawdust applied anytime in the dormant season prevents apothecial emergence. In early spring between budbreak and bloom, destroy developing apothecia by disrupting the soil under plants and/or in alleyways by raking or cultivating soil. Some growers cultivate to pile soil from between the rows at the base of the bushes and between the bushes in order to bury the mummies. They rake soil back into the rows later in spring after apothecia are gone. Other growers drag chains along the ground to disrupt the developing apothecia. Flaming may also be useful. Harvest and destroy mummified fruit from bushes before they drop to the ground. This practice may take several years before a benefit can be realized. Remove and destroy plant debris that builds up on harvester machines before moving to a new field. Also in spring, destroy any cull piles near packing houses. Plant resistant cultivars. Select matching, cross-pollinizing cultivars with synchronized bloom periods so pollination can occur quickly. Remove susceptible cultivars such as Berkeley from mixed plantings. Good weed control aids cultural measures. Organic control Control of mummy berry is difficult using organic tactics. Sulfur or copper-based materials have not resulted in effective protection of new flowers and shoots. Organic growers should then focus on reduction of overwintering inoculum. Scouting and aggressive removal of even the smallest amount of mummy berry during and after harvest can be effective in new plantings that do not yet exhibit much disease. Growers with small acreage should focus on removal of as many mummies as possible at and after harvest combined with aggressive disruption of developing apothecia in the spring. Efforts need to be 99.9% effective to have significant impact on this disease. Application of the herbicides diuron or simazine have been shown to affect the development and sporulation of apothecia. These herbicides may be beneficial when used close to apothecia development in the spring. Consult the PNW Weed Management Handbook for specific recommendations. Protect blossoms and foliage with fungicide from floral bud break to end of flowering. From a farm-wide perspective, start when the earliest cultivars break bud. With regular scouting, the first application can be timed to coincide with apothecial development. Tank-mix and/or alternate products from different groups with different modes of action to prevent the build-up of resistant fungi. Group 3 fungicides have a high risk of resistance development. Abound at 6 to 15.5 fl oz/A. Do not apply with silicone-based surfactants. May be applied on the day of harvest. Group 11 fungicide. 4-hr reentry. Captan 80 WDG at 1.25 to 3 lb/A plus spreader-sticker can only be used starting at mid bloom but may be applied up to day of harvest. Moderate control of both primary and secondary stages. Group M4 fungicide. 48-hr reentry. CaptEvate 68 WDG at 4.7 lb/A Can be used day of harvest. Group 17 + M4 fungicide. 48-hr reentry. Indar 2F at 6 fl oz/A plus a wetting agent. Make reapplication on shortest interval allowed on the label. Do not use within 30 days of harvest. Group 3 fungicide. 12-hr reentry. Inspire Super at 16 to 20 fl oz/A. Do not apply within 7 days of harvest. Group 3 + 9 fungicide. 12-hr reentry. Luna Tranquility at 13.6 to 27 fl oz/A. May be used day of harvest. Group 7 + 9 fungicide. 12-hr reentry. Pristine at 18.5 to 23 oz/A. Do not use with any other tank additive except Captan. Can be used day of harvest. Group 7 + 11 fungicide. 12-hr reentry. Proline 480 SC at 5.7 fl oz/A. Use up to two (2) applications with one targeting the first open blossom. Do not use within 7 days of harvest. Excellent control. Group 3 fungicide. 12-hr reentry. Propiconazole-based fungicides are registered. Do not use within 30 days of harvest. Use of propiconazole for mummy berry control has been associated with an increase in Botrytis severity. Group 3 fungicides. 12-hr reentry. Bumper 41.8 EC at 6 fl oz/A. PropiMax EC at 6 fl oz/A. Tilt at 6 fl oz/A. Quadris Top at 12 to 14 fl oz/A. Do not apply within 7 days of harvest. Group 3 + 11 fungicide. 12-hr reentry. Quash at 2.5 oz/A. Particularly useful when used just before bloom. Do not use within 7 days of harvest. Excellent control. Group 3 fungicide. 12-hr reentry. QuiltXcel at 14 to 21 fl oz/A. Do not use within 30 days of harvest. Sprayers should not be used on apples. Group 3 + 11 fungicide. 12-hr reentry. Switch 62.5 WG at 11 to 14 oz/A. In western Oregon in 2004, it was not effective on any stage of the disease. May be used up to and including the day of harvest. Group 9 + 12 fungicide. 12-hr reentry. Vacciplant at 14 to 22 fl oz/A plus an effective fungicide. Can be used day of harvest. Unknown efficacy in the PNW. Group P4 fungicide. 4-hr reentry. Willowood Azoxy 2SC at 6 to 15.5 fl oz/A. Do not apply with silicon-based surfactants. May be applied on the day of harvest. Sprayers should not be used on apples. Group 11 fungicide. 4-hr reentry. Ziram 76 DF at 3 lb/A. Do not apply after 3 weeks from full bloom. Poor control of both primary and secondary stages. Group M3 fungicide. 48-hr reentry. Note Some registered products offer only suppression of this disease and thus are not recommended for use. These products include Bravo Weather Stik, DoubleNickel 55, Echo, and Fontelis. Forecasting A forecasting program was developed in Nova Scotia, Canada on lowbush blueberry. The program uses leaf wetness and temperature during the wetness period to predict infection. For example, a low risk of infection occurs with 6 hours of wetness at 43°F or 50°F. Use in western Oregon has found that just about every rainy period during apothecial sporulation is found to be an infection period. References Florence, J. and, Pscheidt, J. 2017. Monilinia vaccinii-corymbosi Apothecial Development Associated With Mulch Depth and Timing of Application. Plant Disease 101:807-814. Harteveld, D.O.C., and Peever, T.L. 2018. Timing of susceptibility of highbush blueberry cultivars in northwestern Washington to Monilinia vaccinii-corymbosi, the cause of mummy berry. Plant Pathology 67:477-487.